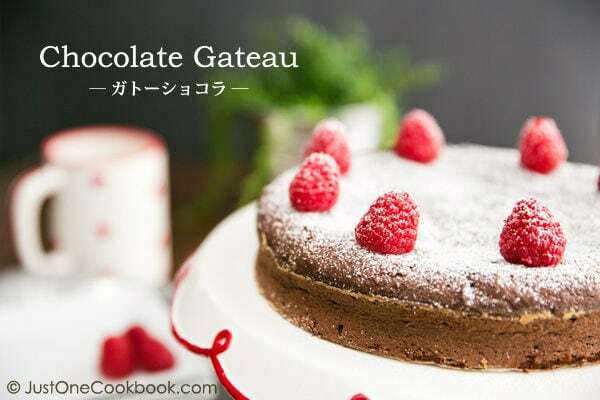 I can’t wait to share this delicious Chocolate Gateau, also known as gâteau au chocolat (ガトーショコラ) that I made over the weekend. Indulge yourself with this rich, dense, yet moist, melt-in-your mouth chocolate cake. It’s utterly divine! Speaking of Valentine’s Day, I thought I should share how we celebrate this day in Japan as it’s a bit different from the U.S. Valentine’s Day was first introduced to Japan in 1936 by the confectionery company Morozoff. Other confectionery companies started promoting this holiday in the 1950s. In Japan, it is only the women who give gifts (mainly chocolates, like Nama Chocolate) to men as an expression of love, courtesy, or social obligation. This custom was originated from the translation error of a chocolate company (according to wiki). Unlike western countries, gifts like greeting cards, candies, flowers, or dinner dates are uncommon on Valentine’s Day in Japan. In Japan, many women feel obligated to give chocolates to male bosses and co-workers. This tradition is known as “Giri-Choko” (義理チョコ), meaning obligation (giri) chocolate (choko). In addition to “Giri Choko”, chocolates are also given to family and others. The chocolate that women give to their loved one is called “Honmei Choko” (本命チョコ). Chocolates for friends (including girl friends) are called “Tomo Choko” (友チョコ). Chocolates for family are called “Fami Choko” (ファミチョコ). When I was living in Japan, a lot of female school children and young adults chose this day to tell the boy/man about their affection. Even girls who were usually too shy to express their feelings took advantage of Valentine’s Day as a great opportunity to express their love (does it sound like I’m talking about my experience? Maybe!). If you are familiar with Japanese culture, dramas and mangas, I’m sure you have seen the “declaring love” (kokuhaku 告白) scene on Valentine’s Day. By the way, while the rest of the world moves on to the next holiday, Valentine’s Day won’t be over yet in Japan. A month later, March 14th is “White Day”, a day when men are supposed to return gifts to women. White Day was first introduced in late 1970s by the National Confectionery Industry Association (according to wiki). Men return gifts like jewelery, white chocolate, candies, and cookies. 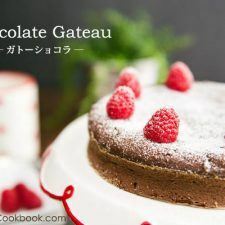 Whether you celebrate Valentine’s Day or not, this moist, dark, and crumbly Chocolate Gateau with a nice cocoa punch will make everyone happy. If you prefer a more chocolatey flavor, you can apply fudgy frosting or chocolate ganache. I like my cake to be simple and less sweet so I decorate the cake with fresh raspberries and powdered sugar on top. After refrigerating the cake for one day, I microwaved a slice for 20 seconds and served it with vanilla ice cream. 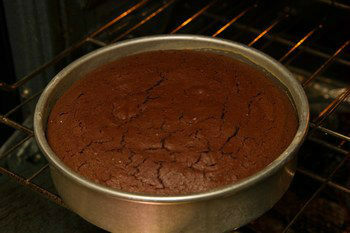 The result was just fabulous: warm moist chocolate cake with the delicate chilled flavor of vanilla. Hope you and your loved ones enjoy this cake! Moist and rich chocolate gateau (chocolate cake), dusted with powder sugar and garnished with raspberry. A nice cocoa punch will make everyone happy. Center a rack in the oven and preheat the oven to 375 degrees F (190C). Butter an 8-inch baking pan, dust the inside of the pan with flour, and tap out the excess. Line the bottom with parchment paper, butter the paper, dust the paper with flour and tap out the excess. Set aside. 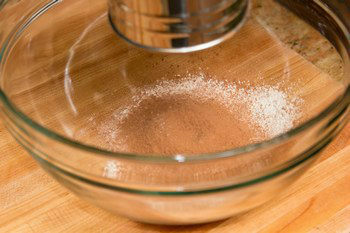 Combine the flour and cocoa powder and sift, set aside. 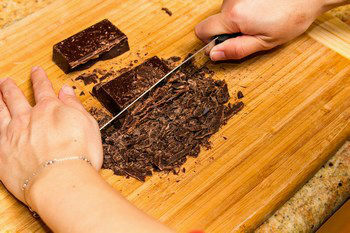 Chop chocolates into small pieces and set aside. 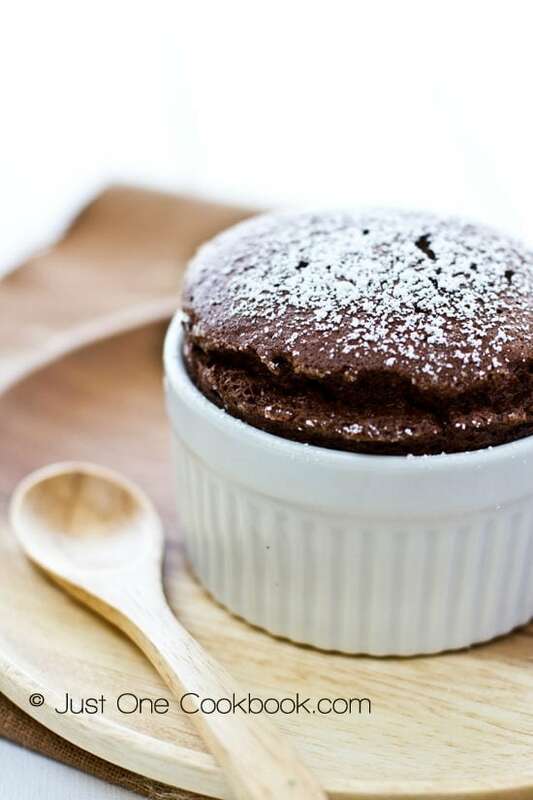 Set a heatproof bowl over a saucepan of simmering water (140F/60C) and add the chocolate. Stir occasionally until the chocolate is melted. Add the coarsely chopped butter and let it melted completely. Transfer the bowl to the counter and let the mixture cool. 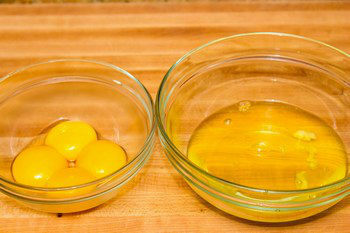 Separate the cold eggs, putting the whites in a mixer bowl or other large bowl and the yolks in a small bowl. 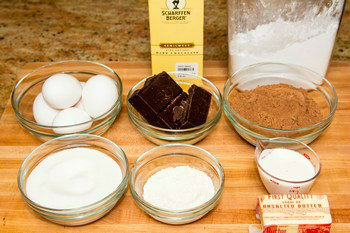 While the chocolate is cooling, place the egg whites in a clean bowl with a pinch of salt. Working with the whisk attachment of the mixer, beat the egg whites until they are foamy and start adding half of the sugar (3oz/90g) in 2-3 separate additions. Continue to beat on high speed until stiff peaks form and sugar is dissolved (about 5 min total). To test for stiff peaks, the peaks should stand straight up when you lift up the beaters. The whites should not slide around. Transfer the meringue into a bowl and wash the mixing bowl for next step. In the clean mixing bowl, beat the egg yolks and the rest of sugar (3oz/90g) until creamy and stir in the heavy whipping cream. 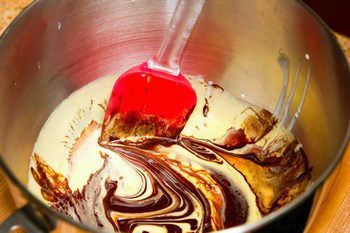 With a rubber spatula stir the chocolate mixture into the egg mixture. Then add the flour and cocoa powder into the mixture. Using the spatula, stir about 1/3 of the meringue in to the batter, then gently fold in the rest until the color is uniform. Pour the batter into the pan and give the pan several sharp taps on the counter to bring up any air bubbles that may be trapped in the batter. Bake at 375 degrees F (190C) for 10 minutes and then lower the setting to 340 degrees F (170F) and bake for 30-35 minutes until a toothpick pulls out moist crumbs when inserted near the center of the cake. Transfer the pan to a cooling rack and let the cake rest for 15 minutes. Run a knife along the edges of the cake and carefully turn the cake over onto a rack and remove the pan and the parchment paper. Invert the cake onto a serving platter before serving. As the cake cools, it may deflate a bit. Decorate with raspberry and dust the powder sugar before serving. Beautiful chocolate cake, Nami! 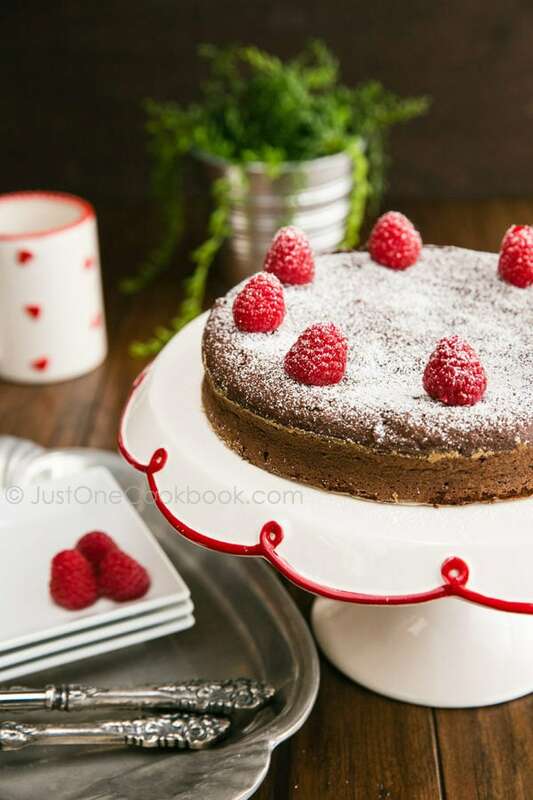 I cook very often Chocolate Gateau, and we always finish it before it cools completely-)) I love addition of raspberries, perfect treat for Valentine day, for sure! Nami, this is stunning!!! I’m so happy you baked :)! Gorgeous photos! What a gorgeous cake, Nami, and stunning photos. Very interesting to hear how Valentine’s Day has translated to Japan. That looks stunning, Nami. My kids will definitely ask me to make this. They love chocolate cake. And can I say your cake stand is just too adorable! Love it!! Nami, what a lovely story about Valentine’s day. I don’t like the commercial way it is done here, but giving chocolates is cute. Maybe we should make them ourselves aswell! Thank you for your kind comment! Well, confectionery stores are having good business for Valentine’s in Japan too… 🙂 Happy Early Valentine’s Day! Happy Valentine’s Day! And also, Happy Lunar New Year this weekend!! That looks fabulous Nami! And you always say that you are not a baker. You just did something incredibly delicious here! I had fun reading the Japanese tradition on Valentine’s day and the month after that. So nice to learn about these things. The cake looks wonderfully rich and decadent. Your Chocolate Gateau turned out beautiful and looks deliciously decadent. Thanks for sharing about the customs and expressions of affection in Japan, Nami! Nami this is outstanding A+ post! Cake looks like from the bakery and pictures making my mouth water. Interesting Valentine tradition, and for sure well written! Nami this looks perfect. I’m so happy you’re finally baking, and you thought you couldn’t do it. I love that you just simply coated it with confectioners sugar and fresh berries! This looks so delicious, and I’m a huge chocolate fan! I really adore the Japanese traditions during Valentine’s day — I think it really takes the focus away from the commercialism in the holiday and puts the emphasis on expressing love and appreciation for others. And what better way than through dessert? =) Thanks for sharing the cultural background and for the wonderful recipe! What a beautifully presented incredibly mouthwatering treat my friend – and you say you don’t bake! You know how thrilled I am to see this. It looks perfect and your presentation is beautiful. I love the cake stand! I am in shock, you made cake! This is a favorite chocolte kind of mine, dense and intense. Obliged to give men chocolate. I will be selfish and keep the chocolate for myself. Funny we call November 25th Saint-Catherine’s day in Quebec the day of single women that can make taffy for boys they like. Ahhhhhhhh! I am crazy about chocolate but living in Japan, I started to fear Valentine’s day. Yes, on this day, it is women/girls who give to men/boys but not only to their loved ones but also to friends and colleagues which is called giri chocolate (obligation chocolate). And if you receive some, on white day, you have to return the favor. It has become quite a budget. 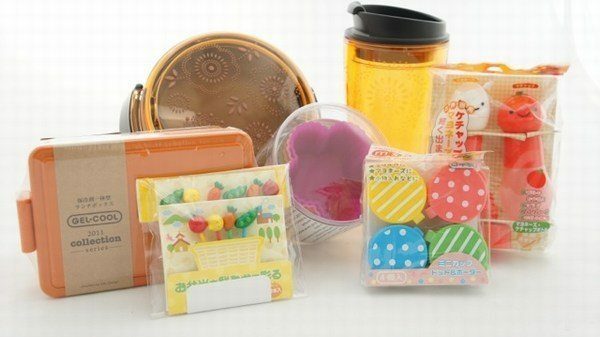 Thanks to Nami, this year, I will try to bake two cakes and then give some around on White day. Interesting the celebration in Japan, so different…we didn’t celebrate like in the US, I mean, it’s not so comercial here, well, it was not, but looks like Valentine’s Day is becoming more and more important. Oh my goodness, this chocolate cake made me crave chocolate so much right this minute! I’m going to have to bake this delish gateau chocolate cake. Thanks for sharing this recipe and the interesting facts about Valentine’s in Japan. Enjoy yours, Nami! This looks so so indulgent! I love that the insides are both dense and also slightly airy. It’s the perfect combination. 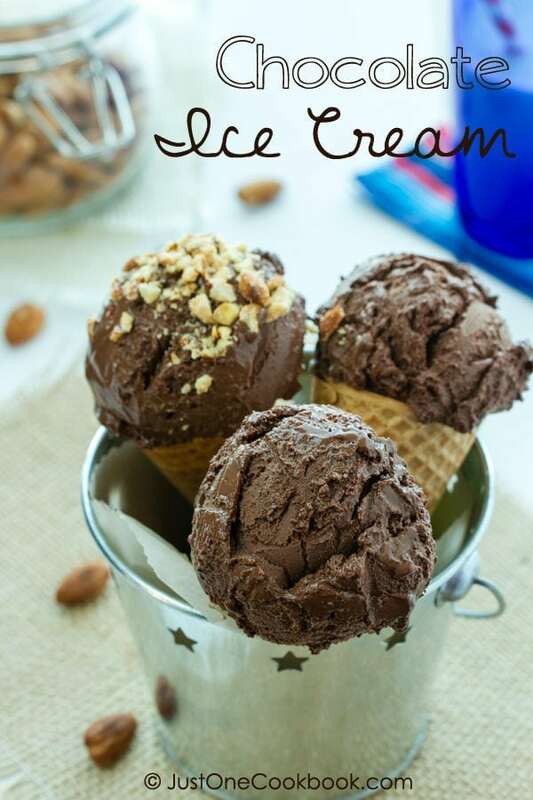 I tried not to visit this post tonight because my chocolate craving is so big right now. Well, as suspected, it didn’t help because this cake looks so good. The craving is bigger than ever! I love that you shared how Valentine’s Day is celebrated in Japan. I love learning about how other countries and cultures celebrate holidays. This cake is lovely and I love the raspberries on top! There is a lot to learn when it comes to Japanese customs and Valentines day is totally different from Western customs. Thank you for educating a lot of your readers like me. This cake will make Valentines day very special as it is so beautiful and delicious. I loved reading about how you celebrate Valentine’s in Japan! It is very interesting to learn how different cultures have adjusted celebrations like this to their mentality. I love your cake because I am a notorious chocolate lover lol. 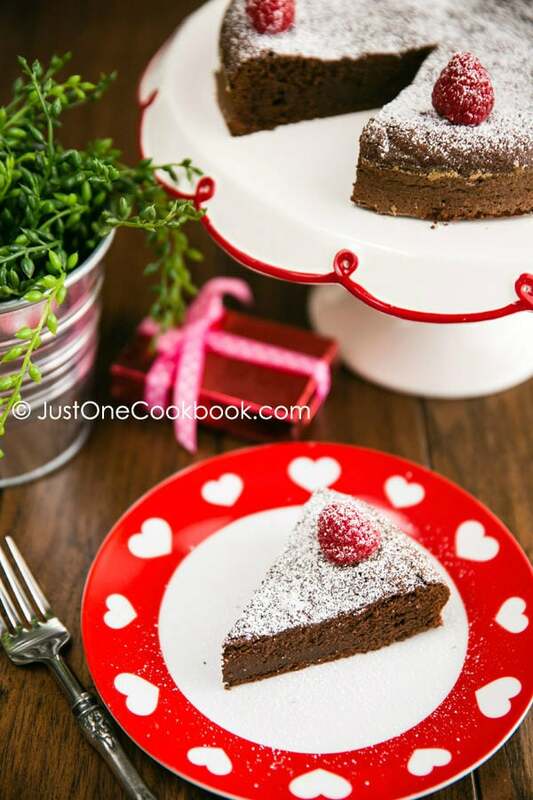 Nami, this is an absolute show-stopper – you really took amazing pictures of your delectable Valentine´s Day Chocolate Cake! 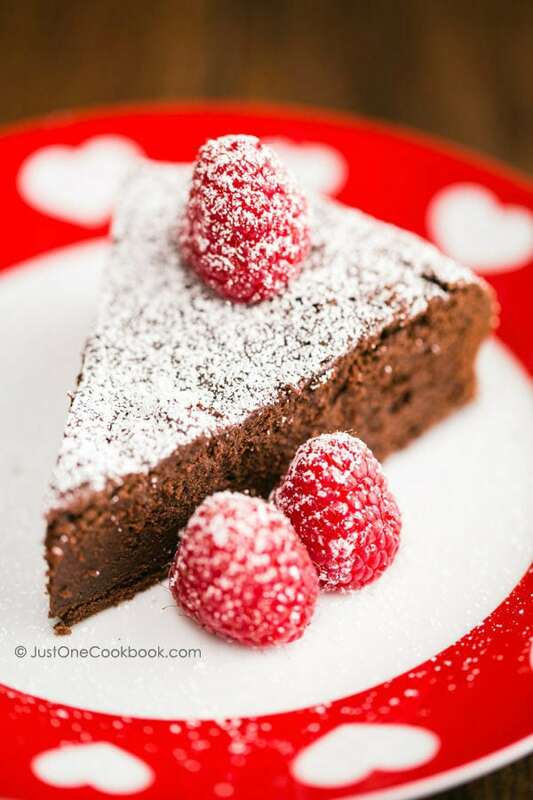 I love the combination of fresh raspberries with chocolate cake – particularly at this time of year! Now that is something I could never say NO, 🙂 not even at 12 pm.. hehehe.. gorgeous dessert indeed. Hi Nami! I will definitely try this recipe out for this weekend at my family’s Chinese New Year gathering! 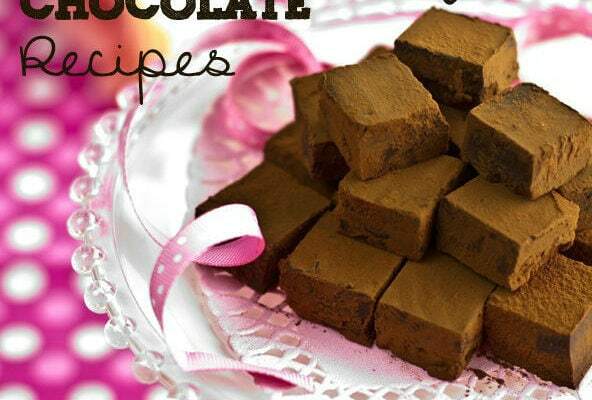 Just a question, on the ingredients list in the recipe, it says that 2 cups of cocoa powder are needed. Is this a typo? Or is 2 cups of cocoa powder the correct amount? It should be 1 cup minus 1 Tbsp. Thank you so much for noticing my mistake! So delicate and light, Nami-san! hi Nami, that looks too divine, and I love the way your Valentine’s Day is different from our western one, always fascinating. I also like the way you honoured your cake with no suggestion it was wicked or naughty in any way!! Your posts are always a pleasure. How fascinating that there are multiple words for chocolate gifts, how about on for Belinda chocolate gifts? What a lovely chocolate cake, Nami! Your baking skills amaze me. I never manage to obtain such neat and equally shaped cakes. Not to mention the decoration. I hate Valentine’s Day and have never celebrated it in any way, but I would love such a gorgeous chocolate treat any day of the year. Lovely recipe and delightful gift ,that I wish to receive any time.and I will be glad to know more about your experience Nami . Nami, your desserts always wow me! This looks magnificent, my friend…you are as good of a baker as you are a cook. Brava!!! the photos of the cake are BEAUTIFUL! This looks good. But I have some questions. Can I find cocoa powder in Japan and what is the Japanese word for all purpose flour? Hi Lele! You can find at a regular supermarket in Japan. This is simply gorgeous. I can’t believe how much I love chocolate, and this looks like the kind of chocolate cake that is just filled with flavor. Like a big brownie! Darling little cake. I love hearing about the Valentine’s practices in Japan too. I knew about the “declaration of love” but didn’t realize that women presented gifts to men. So interesting to hear about the Japanese customs! It’s funny how it’s so different, but that’s what makes this world so interesting. Love this cake Nami, and especially micro’d with ice cream! Yum! Oh I love the Japanese custom for Valentine day and then White Day!! Makes much more sense than the way it’s done in the U.S. Years ago Bobby and I gave up the “traditional” Valentine’s. Now he usually cooks me supper and I make dessert. (Will be posting that tomorrow. 🙂 ) When I was teaching a male teacher always placed a red carnation on all of the female teachers’ desks. It was so sweet. What a wonderful chocolate cake my non-baker friend. 🙂 This is definitely a cake I could make and enjoy eating! It’s so moist and quite simple. Love it! Have a wonderful Valentine’s! Hi Nami! Thanks for sharing the Japanese way of celebrating Valentine’s day. Really interesting gift exchange! So does that mean on the White Day a month later, the man will only return the gift to the woman he fancies? Or he has to return gifts to all the women who had bought him gift on Valentine’s day? That’s fascinating – I love hearing about how different countries treat holidays! 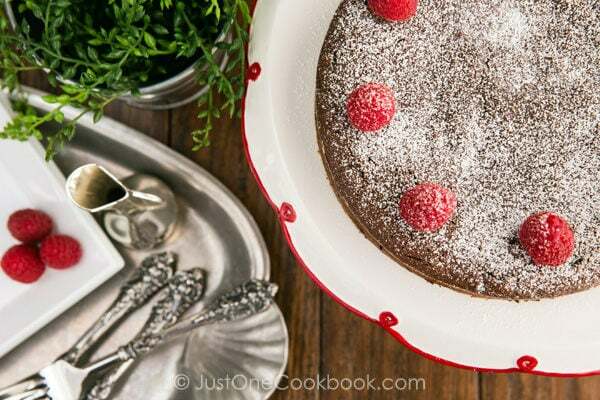 That chocolate cakes looks perfect, love the color from the powdered sugar and raspberries. Oh, this cake looks sooooo good. I have to make this! If I wanted to put frosting on it, do you have a recipe for it? Hi Cynthia! I’m sorry I don’t have a recipe for frosting, but I highly recommend this chocolate ganache. Wonderful cake! I’m all for chocolate anything, so this has all of my attention. Great pictures, also. I particularly liked learning about how Valentine’s Day and White Day are celebrated in Japan. I’d never heard of White Day. Really interesting – thanks. Nami, your posts are filled with so much more than just wonderful food! The history behind Valentine’s Day in Japan was fascinating, as was White Day. 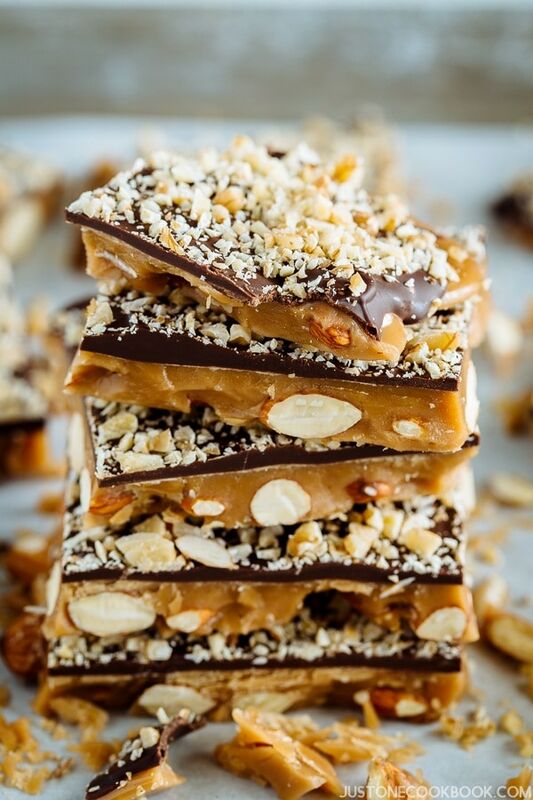 Thanks, too, for including the recipe measurement conversions and stunning photos, as always. Such a pleasure to visit you! Beautiful cake! Simple and easy. I love the idea of warming it up the next day in the microwave. I like warm chocolatey dessert with ice cream. What a beautiful cake! I’m not much of a baker, but I’m tempted to make this. BTW, I love your new(?) logo! I’m not much of a baker too – if I bake once a month, that’s pretty good… 😀 Thank you for your compliment about my logo. I changed it at the end of last year but I changed my Google+ profile yesterday (and I think you noticed there). We call a Japanese bowl “wan” so I use the picture of “wan” for “one”… 🙂 Do you say “wan” for bowl too? Chinese is the same, according to my husband. Love this cake, Nami! So decadent and beautiful! Perfect for V-Day!! Your cake is so beautiful, Nami! I don’t think I’ll ever be able to bake something like that. Thanks for sharing how Valentine’s day is celebrated in Japan as it’s really interesting and at least it’s fair that both parties have a day to show their affection for each other! This is absolutely beautiful Nami! 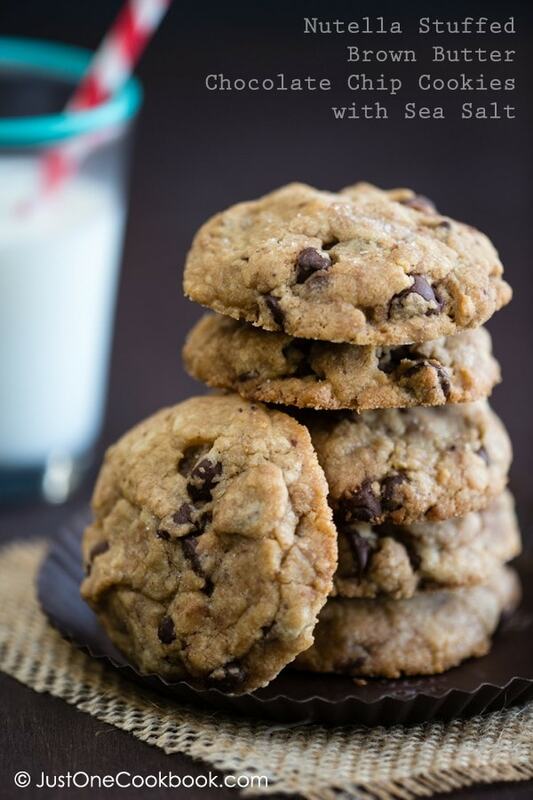 Wonderful job on the recipe and photos too… lovely! Thanks for sharing such a nice sweet treat for Valentine’s Day. Enjoy the day with your family! I like that Japan has Valentine’s Day and White Day–more chances to eat chocolate! 😀 And that cake looks gorgeous. I love the last photo with the berries and powdered sugar. How interesting that the chocolate giving is the other way around in Japan! That’s a nice Valentine’s tradition..because a month later the boys return the gifts to the girls..LOL! Love the cake, Nami! Thanks for sharing the history of Valentine’s Day in Japan, I enjoyed reading all about it. And drooling over that cake. Delicious case! I have a very similar recipe for this case and I just love it… my husdband loves chocolate and this case is so easy to make. For us Valentine’s Day is very special… we had our first date on the 14th Feb. I loves seeing you baking for cakes because that is what I loves too. Your chocolate cake simply look gorgeous and bet it is delicious too, I know it is. Love, love, love your baking, Nami. Gosh, I had no idea of the Valentine’s Day customs in Japan – fascinating. I think living in Japan at this time of year would suit my Valentine, indeed! 🙂 Never mind Nama Chocolate; there should now be a custom called Nami Chocolate Cake! Stunning cake, Nami! You say you’re not a baker, but I beg to differ…you are creating some lovely baked goods in your kitchen. I would happily devour a slice of this cake with my coffee right now! I love that kind of cake. Yours looks divine and wonderfully moist. A great Valentine’s Day treat. This cake looks exactly like the one my mom does in France ! We eat it with a cold vanilla flavoured sauce called “crème anglaise”, it’s one of my favorite, you should give it a try ! I dont know what to say, it;s just spectacular! Looks amazing! I reckon I could eat that whole thing all by myself! Also, thank you for the very sweet comment…I really, really appreciate it. What a lovely cake! And chocolate, too! YUMMY! I think many American men wish they could move to Japan, especially after reading about how the women give the gifts, not the men for Valentine’s Day! Hi Nami, I saw your gorgeous cake on Facebook (and various other places) and had to come over and have a closer look… it is utterly beautiful, chocolatey and perfect for Valentine’s day! And, could there be a more wonderful pairing than chocolate and raspberry in the entire universe?! :). Your photography is as captivating as ever. WOW! What an interesting story about Valentines day and white Day. I never would have imagined that the Japanese celebrate differently. I love the look of your decadent cake, so lush! This looks so cute and delicious! I always see this cake when I got to Japanese supermarkets. 🙂 I think it’s adorable whenever I watch a Jdrama or read manga where a girl is confessing to a boy! I made this today for my family’s Valentine dinner and they love it!! The cake itself is kinda melt-in-your-mouth, and I might try cake flour next time to get the sponge-y texture. I just want to point out that the amount of sugar in the ingredients list is 180gr but on procedure numbers 8 & 10 both list only 60gr each, making it 120gr total. Thank you for sharing this recipe. Hope you had a great Valentine’s day!! Hi Khristine! How embarrassing! I’m not good at math, but still this mistake was so elementary level that I’m very embarrassed. =P Thank you so much for pointing that out. At least oz. amount was correct… I updated my recipe. 🙂 Thank you! I’m glad your family enjoyed the cake. Thank you so much for writing your feedback here. 🙂 Hope you had a nice Valentine’s Day! Your chocolate cake looks amazing! Really drool-worthy! Thanks for sharing a bit of the Japanese culture. Didn’t know the V-day is only for girls to give gift for the guys and show affection. 🙂 Good that there’s a day the guys will return the favor in March! hahaha…. I would simply adore this cake! Reminds me of the ones my mother used to make while she and my family lived in France; a tiny bit of flour, lots of chocolate and eggs and voilà~ perfect not only for Valentines, but for every week-end for a chocolate-induced happiness. Nami, this cake is absolute perfection! I want to make it right now, it looks so delicious! I love your step by step photos!! I’m still learning my own oven. Thanks for letting me know the update! Hi Nami! Just wondering, is this cake a Japanese recipe? I have to bake a Japanese recipe for school, and I would love to take this in! If it isn’t a Japanese recipe, can you please give me a recommendation on another of your Japanese desserts? That would be great! Hi Jake! It’s popular in Japan, but it’s NOT “Japanese” recipe. I’m not sure if you’re interested, but here are some baked goods and non-baked desserts that are considered Japanese. I’ve made this chocolate cake too. No words to describe it! I’ve also added a chocolate ganache and a little touch of white chocolate to decorate. As usual I leave the link to the picture, I appreciate that you share them on your fb page! Hey Nami, my friend is having a party tomorrow and I was wondering if a 9 inch pan would work. Would it just make a flatter cake? Oh my ,this Chocolate Gateau was the best I’ve ever made and tasted in my whole life,though my meringue did not form stiff peaks where by mistake I added the entire sugar to the egg whites,with my little girl playing havoc in the kitchen. I still ended up with a rich creamy chocolate texture and nice crisp crust. I hope it’s suppose to be the same. Thank you Nami for Sharing your lovely recipe. I can’t wait to try out your Japanese cheese cake Souffle. Hi Vania! So happy to hear you liked this cake! I don’t’ think your little mistake created any issue for the outcome. Glad to hear you enjoyed it! Good luck with the Souffle Cheesecake (this one, meringue is very important! ;) ). I love this recipe! I’m looking forward to making this, possibly for Valentine’s Day. For the eggs, you reduced it to 3? Thank you! Hello, I tried doing this with my 4 year old. We had lots of fun! His favorite part was licking the pan where we melted the chocolate. I however, didn’t have enough cocoa powder so I added instant coffee instead. It doesn’t look pretty, but it tastes well. A little too sweet for my taste even when I cut down on the sugar. Maybe I’ll just use half of the sugar next time. Hi Nami! Can I use a 6 inch baking pan? How should I alter the baking time? Hi Jenny! Yes, you can make it in 6 inch baking pan, but if your pan is not a tall pan, you will need more than one pan. I haven’t tried it with 6 inch before so I can’t give you exact baking time. But make sure to insert the skewer in the center of the cake and check doneness around 25-35 mins. Can you also share with us a recipe using white or dark chocolate? Thank you! I’ll put on my list. 🙂 Thank you Trixia! Hi Nami! Love your website! I have used so many recipes and it’s always been a success! Thanks for sharing! I was wondering about this chocolate cake recipe whether I’d get similar results without the heavy whipping cream… I try to avoid using such ingredient because I find it on the heavy side… but I’m hoping to either do without or find a lighter substitute?! Thanks in advance! Hi Huyen! Thank you for trying my recipes and I’m so happy to hear they came out well. Thank you!! Hi Huyen. So did you tried the recipe without heavy cream? I had runned out of heavy cream and thinking if I can use any substitution. Hi Nami! I had followed your chocolate gataeu recipe for a few times and everytimes it turns out super nice with moist and smooth texture. However, recently I baked it using my new oven, but the cake turned out to be dry and hard. Do you have any idea how should I do it? Shall I reduce the temperature of baking or reduce the time of baking? mixer? the texture or whatever it is still thesame? Had cravings for chocolate cake after looking at your picture. Decided to make the cake this morning. Outcome: taste is as per discribed – very rich, moist and full of chocolate flavour (even though I used only a Hershey’s semi sweet chips – which is the best that I could get in India). I used a 6” cake pan so my baking time is almost 100mins. The updated recipe is accurate, so thank you for being diligent in ensuring that the recipe is corrected. Just wondered if this recipe freezes ok?? Hi Beth! I have never done it, but I’m sure this freezes well. 🙂 Enjoy!